The Curvy Copter demonstrates that cuts do not need to be straight. 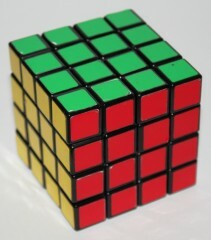 The core and shell together do not entirely determine the nature of a puzzle, because there will usually be a range of possible ways to cut the shell into component pieces or “cubies”. Looking at an unusually cut puzzle like the Curvy Copter, it may seem like just about any cut is permissible, but in fact there is a simple but highly restrictive rule on what is a permissible cut: every cut must be follow a surface of revolution about the turning axes. Take a path that starts somewhere on our turning axis and radiates out from it somehow. It can be straight or curved, as long as it doesn’t cross itself. Now rotate that path around the turning axis, and note the surface that it sweeps out. Such a surface is called a surface of rotation. Intersect that surface with your puzzle shell, and you have a legitimate cut — but you have to make the same cut for every axis of rotation in that particular conjugacy class. Rubik’s Revenge has straight cuts, the result of intersecting the shell with a series of planes normal to the axis of rotation. The simplest path is a straight line that radiates out from the axis of rotation at right angles. The corresponding surface of rotation is simply a plane normal to the axis, and when we intersect that with our shell we get the nice straight cuts that we associate with the Rubik’s Cube. The next simplest path is a straight line that radiates out from the axis on an oblique angle. This produces a conic surface of rotation, and when intersected with the puzzle shell we obtain curved cuts such as those seen on the Curvy Copter and the Rex Cube. More complicated paths are perfectly workable. This has not been explored much but is nicely illustrated in the unusual cut of the Venus Pillow. Given certain assumptions it is possible to list all the topologically distinct cuts for a given core type, and thereby enumerate the puzzles that exist, and discover new puzzles. Take, for example, the face/vertex-turning tetrahedron puzzles (Recall that the tetrahedron is its own dual, so the distinction between face-turning and vertex-turning is meaningless). We will consider only single-layer puzzles; that is, puzzles with a single cut along each axis. Note that when these cuts are applied to a face, they will divide that face up into pieces that are not affected by any vertex turns, pieces that are affected by exactly one vertex turn, pieces that are affected by exactly two vertex turns, and pieces that are affected by exactly three vertex turns. Equivalently, these are pieces that are affected by turns of three, two, one and zero neighbouring faces, respectively. The topology of a face is determined by whether or not each of these piece types is present on a face. That gives us 16 possible distinct topologies to check. We can throw away topologies that lack any pieces that are affected by more than one turn (vertex or face), because these don’t count as puzzles. Also, the dead centre of a face must be either inside all cuts or outside all cuts, so it will be affected by all three vertex turns or none of them. Thus a puzzle face cannot simultaneously contain a piece this is affected by three vertex turns and a piece that isn’t affected by any vertex turns. A puzzle that to my knowledge has not yet been invented. 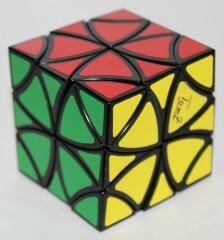 At first glance it looks like Jing’s Pyraminx, but in Jing’s Pyraminx the centre piece is always on the vertex side of the cut, whereas in this puzzle the centre piece is always on the face side of the cut. This is by no means an earth-shattering discovery. I expect that it differs from the other two puzzles about as much as they differ from each other, which isn’t much. All the same, it is a very interesting discovery… and even more interesting is the fact that we can use math to “discover” a puzzle rather than inventing it.